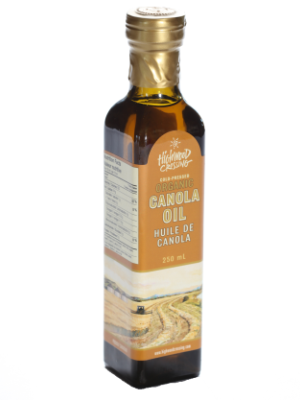 Highwood Crossing’s Certified Organic Cold Pressed Flax Oil tastes wonderful drizzled on vegetables, rice or pasta. Enjoy flax oil in place of butter with corn on the cob, new potatoes or any cooked vegetables. Flax Oil is often used in salad dressings, smoothies, mixed with protein powders, cottage cheese or yogurt or taken daily as a natural supplement. Our organic cold pressed flax oil is unrefined, certified organic and non-GMO without additives or preservatives. Freshly pressed every week in a nut and peanut free environment with no traces of soy or dairy. Rich In Healthy Omega 3 Fatty Acid! 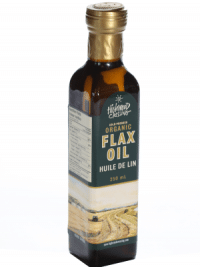 Not surprisingly, Flax Oil tops most lists as the best vegetarian source of Omega-3 alpha-linolenic acid… because just one tablespoon of flax oil delivers a whooping 7196mg of Omega 3 essential fatty acid. Current research findings suggest that Omega-3 fatty acids help lower blood triglyceride levels and maintain the integrity of blood cell platelets. Omega-3 fatty acids are also required for normal growth and development and good vision. Cold pressing is an ancient method of pressing oil seeds in which seeds are not heated before, during or after the pressing process. Seeds are cleaned and mechanically pressed at a slow pace to limit friction and avoid elevating temperatures. Our oil is pressed at low temperatures to the exclusion of light and oxygen which break down nutrients. The natural cool process never robs the seed of important vitamins, minerals or essential oils, so the resulting oil is fresh, full of flavour and has the nutritional power similar to that of the whole seed. Cold pressed oils are high in essential fatty acids and vitamin E.
Health Canada recommends that our bodies need a minimum of 1.1 grams to 1.8 grams of omega-3 per day for healthy growth and development. One teaspoon (5 ml) of fresh flax oil contains approximately 2.4 grams of omega-3! Highwood Crossing’s Certified Organic Cold Pressed Flax Oil tastes wonderful drizzled on vegetables, rice or pasta. Enjoy flax oil in place of butter with corn on the cob, new potatoes or any cooked vegetables. Flax Oil is often used in salad dressings, smoothies, mixed with protein powders, cottage cheese or yogurt or taken daily as a natural supplement. Flax oil is not suitable, however, for frying or cooking as the omega-3 essential fatty acids are sensitive to high cooking temperatures. Store flax oil in the refrigerator once opened for a maximum shelf life of four months. Flax oil can be stored and used directly from the fridge. Our organic cold pressed flax oil is unrefined, certified organic and non-GMO without additives or preservatives. Freshly pressed every week in a nut and peanut free environment with no traces of soy or dairy. The couple behind High River-based Highwood Crossing, known for their grains, cereals and flax oil, have been named one of 20 up-and-coming food artisans in the country by ACE Bakery and a panel of chefs and writers. The incubator, created by ACE Bakery in recognition of the mentoring the founders received when they were starting their business 20 years ago, is aimed at giving culinary artisans national exposure as well as business insights to help them grow their own companies. A panel of “tastemakers” — including Charcut’s John Jackson and Connie Desousa — selected the 20 artisans who will travel to Toronto in June. Also on the panel were Chef Lynn Crawford of Food Network Canada’s Pitchin’ In and Toronto’s Ruby Watchco and Canadian culinary activist Anita Stewart. For a complete list of the artisans, please visit ACE Bakery Artisan Incubator.